Governor Andrew Cuomo has signed the new changes to the teacher evaluation law. NYSUT President Andy Pallotta is ecstatic. "Finally!" said President Andy Pallotta upon enactment of the state's teacher evaluation reforms. The changes end the mandate that tied evaluations to state standardized tests and restore local control and collective bargaining to the process. "Educators across New York earned a huge victory after banding together to push for fixes to the broken teacher evaluation system that created undue stress for teachers, students and parents," he said. I get we can't have state tests used to rate us unless our union agrees with it but basically nothing much changes in evaluations. Teachers are still rated half on student assessment results on some assessment that is not designed to evaluate teachers. Here is a link to the NYSUT Fact Sheet on the new law. Anyone who can explain it so that a non statistics major can understand it gets a prize. UFT President Michael Mulgrew has won his fourth term as the union’s president. Mulgrew, the Unity Caucus candidate, received 38,591 votes, or 86.2 percent of the votes cast, while Solidarity Caucus candidate Lydia Howrilka received 3,604 votes (8 percent) and Dermot Myrie the candidate of the MORE caucus, got 2,540 votes (5.6 percent). Mulgrew's margin of victory was huge compared to 2016 when MORE ran with New Action and Solidarity only ran individual candidates however Mulgrew's vote totals actually went down slightly from 2016. Mulgrew's totals dropped in spite of having former opposition leaders Arthur Goldstein and Mike Schirtzer now running on the Unity slate and having for the first time a massive get out the vote campaign that included numerous robo-calls to members reminding us to vote along with text messages and an annoying ad on the website that blocked everything. The ad told us to vote. Opposition group MORE's vote totals fell off a cliff compared to 2016 when they ran with New Action. Meanwhile, Solidarity received some of the MORE support. That is a fairly substantial increase for Solidarity which does not exactly have much of a presence in most schools. New Action took some of the opposition votes too but we don't know the NAC numbers yet since they did not run for officer positions and all we received was the officer totals. A few opposition voters went to Unity with Mike and Arthur but many others became part of the garbage can vote as they threw the ballot away. Hopefully, they recycled the paper. Unity won the entire 102 seat Executive Board. There will be no representatives there that did not run with Unity. We look forward to seeing how Lydia does as the leader of the opposition. She's the Shadow President. I have no idea what these three stories have in common but they are all current. The UFT election that my friends and family in the schools told me was one big, giant yawn of indifference is over and the votes will be counted today. We already know Mulgrew/Unity will win by a huge margin. We will see how the three opposition groups do. Maybe after this election there will be attempts to pick up the opposition pieces or perhaps it is time to concede for good that the Unity machine is too strong to challenge electorally. Unity might not look out for the working conditions of the average teacher that strongly but they are certainly adept at protecting their own power that they will never yield, certainly not with the current UFT electoral structure. I acknowledge there are exceptions as some veterans do move through the Open Market but how many knew an assistant principal or principal that pushed for them? This is truly a system where it's not what you know, it's who you know. Does anyone believe this is a fair hiring process? Also, does anyone have any information on schools to avoid? A reader who often sends me interesting, if sometimes depressing, links sent me one from the NY Post on Governor Andrew Cuomo advocating for the State Legislature to lift the charter school cap to allow even more publicly financed privately managed-privately accountable charter schools to open in New York. With friends like Andrew Cuomo, public school teachers truly don't need enemies. I guess we should be thankful that the Governor did not make this part of the budget process. Cuomo could have used the leverage of the April 1 budget deadline to add more charter schools in NYC but now lifting the charter cap will be another negotiating tool in Albany's June "big ugly" part 2 where compromises are reached on what passes and does not in last minute bills at the end of the legislative session. I am not ruling out the Democrats in the Legislature caving on the charter school cap being raised even though we know charter schools take needed resources and space from public schools and overall do no better at educating students. Charters get unusually favorable treatment as their backers have money and donate a great amount to politicians like Cuomo and others. By contrast, public school supporters protested at Tweed (Department of Education Central Office) on Monday telling the Mayor to stop giving student contact information to charter schools since as parent activist Leonie Haimson put it, "our state law bars the use of student data for marketing purposes." Expecting our mayor to stand up to the charters is expecting too much although de Blasio is better than his predecessor Bloomberg when it comes to charter schools. Is this a new Randi or should we be cynical? I watched the Town Hall and was not impressed with Bernie's responses on education. Talked pre-k and college. Nothing much on k-12. I like many of Bernie's positions, particularly on labor, but on education he has been less than ideal. In 2016, he supported charter schools. It was more encouraging that the Sanders campaign recently reached out to Diane Ravitch to discuss education. Perhaps his people will listen to Ravitch and move Sanders on the k-12 education issue. 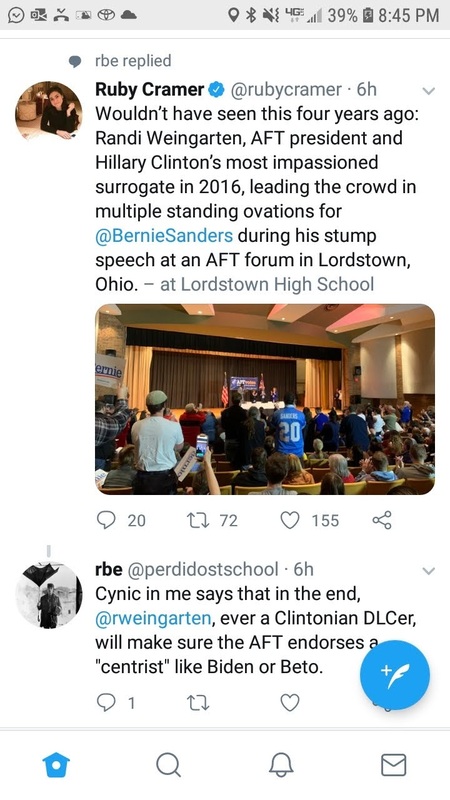 She (Bernie's education advisor) called and conferenced in the campaign’s chief of staff. I told them that I was upset that Democrats talk about pre-K and college costs—important but safe topics—and skip K-12, as though it doesn’t exist. Every poll I get from Democrats asks me which issues matter most but doesn’t mention K-12. I expressed my hope that Bernie would recognize that charter schools are privately managed (in 2016, he said in a town hall that he supports “public charter schools but not private charter schools). No matter what they call themselves, they are not “public” schools. They are all privately managed. I recounted for them the sources of financial support for charters: Wall Street, hedge fund managers, billionaires, the DeVos family, the Waltons, Bill Gates, Eli Broad, ALEC, and of course, the federal government, which gave $440 million to charters this year, one-third of which will never open or close soon after opening. (See “Asleep At the Wheel: How Athens Federal Charter Schools Program Recklessly Takes Taxpayers and Students for a Ride,” Network for Public Education). I proposed a way to encourage states to increase funding for teachers’ salaries. I won’t reveal it now. I think it is an amazingly innovative concept that offers money to states without mandates but assures that the end result would be significant investment by states in teacher compensation, across the board, untethered to test scores. I recommended a repeal of the annual testing in grades 3-8, a leftover of George W. Bush’s failed No Child Left Behind. I pointed out to them that all the Democrats on the Education Committee in the Senate had voted for the Murphy Amendment (sponsored by Senator Chris Murphy of Ct), which would have preserved all the original punishments of NCLB but which was fortunately voted down by Republicans. I suggested that grade span testing is common in other developed countries, I.e., once in elementary school, once in middle school, once in high school. We had a lively conversation. Our values are closely aligned. They are in it to win it. I will watch to see if Bernie moves forward with a progressive K-12 plan. No one else has. My options are open. My priorities are clear. I agree 100% with everything Diane said. "We must make sure that charter schools are truly serving the needs of disadvantaged children." If that is as far as Bernie will go on charter schools, the main privatizing force, it is not promising. My home phone has been bombarded with robo-calls the last few days telling my wife and me to vote in the UFT election that is ongoing. The call for active teachers (my wife) is from an anonymous voice and it is basically impartial. It does say that we are the strongest and largest union in the country that needs you now. Then the voice says that we need you to cast your vote and that turning out matters to demonstrate the strength of our union and that we vote. The implication is that we are the strongest and largest because of our democracy. I give this call a fairly neutral rating. However, the message from Retired Teacher's Chapter Chapter Leader Tom Murphy in his robo-call to retirees is not very neutral at all. I have received the call three days in a row. It may as well have been a Mulgrew/Unity campaign ad. It starts with Murphy's recognizable voice and then the reminder about the ongoing election. Murphy then praises the UFT as one of the only unions in the country that allows its retired members to vote for the entire leadership of the union. The praise then turns to scare tactics as Murphy tells retirees to "vote as if your economically secure life depends on it. It does." This is a loud political dog whistle if ever there was one to vote for Mulgrew. He may as well have said that we have to vote not to let those lefties from MORE or New Action or those Solidarity people get a hold of your pension and then you may end up broke. Could you imagine Governor Andrew Cuomo calling us with taxpayer money on election day telling us to vote in the election as if our economically secure life depends on it? The non Democrats would go nuts. That is the equivalent of what is going on here. Murphy is actually on the ballot for a Convention Delegate for AFT/NYSUT position and he is making robo-calls. 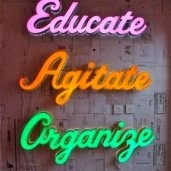 People as UFT politically savvy as Norm Scott and I even vote for the ones we know and like. I like Mulgrew a lot more than you would think. I've had almost no contact with him personally, but get a kick out of him. If we were in a different world I could sit down and have a beer with him. But I can't vote for him. After some thought, including considering not voting for president, my vote goes to Solidarity's Lydia Howrilka who showed great energy in running against Mulgrew and also bravery in taking on this task while fighting for tenure. I first met Lydia 6 years ago at the Portelos hearings. She was discontinued, which in almost all cases means the death of a career. I've never seen anyone put up the fight to stay in the system Lydia has. I also grew to like Lydia who attended some ICE meetings and made some passionate comments about why she was active in the union. He knows her and likes her. I was considering burning the ballot since retirees should vote for a vice president but not the President who represents active people but I got to know Lydia too and many in the Solidarity crew and had no problem voting for them. (This is me speaking, not ICEUFT.) We have to work within the rules that exist, not the ones that are fair so I voted as did my wife. If you don't think the election is a joke, check out the page on the ballot for the Functional (non-teaching) Executive Board. Nineteen candidates for nineteen spots and all from Unity. I have to vote as if my economically secure future depends on it Mr. Murphy? Yeah right! For Unity to have to resort to political dog whistle robo-calls to retirees when they know they have every advantage, including being the only ones on the ballot for hundreds of positions, is rather abhorrent. I did not vote for any Unity candidates. It is basically a morally bankrupt political machine and anyone who runs with them is just feeding it and the corporate Democratic Party interests our union endorses that in so many ways hurt teachers and public schools. 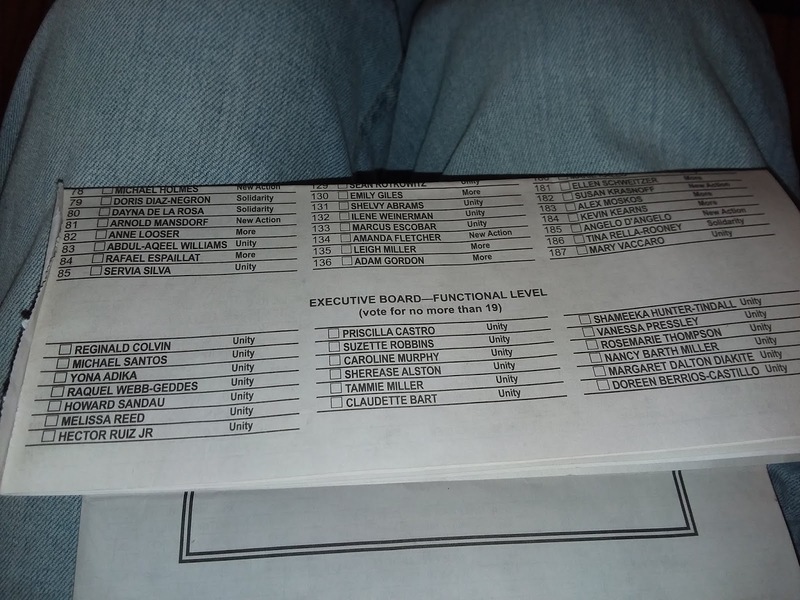 The UFT ballot for Functional (non-teaching) Executive Board. Notice all of the candidates are from Unity. I have been saying since 2005, before the infamous 2005 UFT Contract, that the only way working people are going to turn it around in this country is if we are willing to work together with other unions to credibly threaten really large actions. At the suggestion of my friend Sam Lazarus, I proposed to Randi Weingarten at the UFT Executive Board in 2005 that the UFT should combine forces with the Transport Workers Union to truly threaten to shut down the city in a huge combined action. Randi responded that she spoke to Roger Toussaint, then head of TWU Local 100, but soon thereafter the UFT conceded to the worst contract ever and the transit workers were left out alone in their strike. Weingarten did not even have the guts to call the TWU strike courageous. Fourteen years onward, it is encouraging to see a real labor leader talking about working people coming together. Sara Nelson is the President of the Association of Flight Attendants-CWA. Could you even conceive of AFT President Randi Weingarten or UFT President Michael Mulgrew saying anything like this? Until we are willing to fight together as working people, we are going to continue to be stepped on by the government/corporate elite. 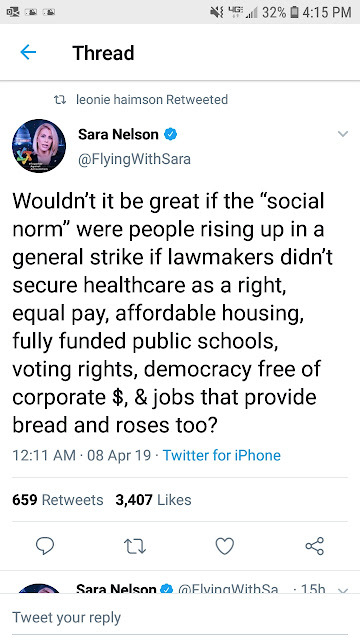 Non-violent labor militancy is the best way forward, not looking for a seat at the table with the corporate Democrats. For more Sara Nelson, here she is on MSNBC talking about the grounding of the 737 Max 8 and 9 after two related crashes.